There's a new event which called Special Beauty Coupon Event allows you to change up your style in MapleStory. If you participate in the special event, you might snag a fancy new look by using the coupons. 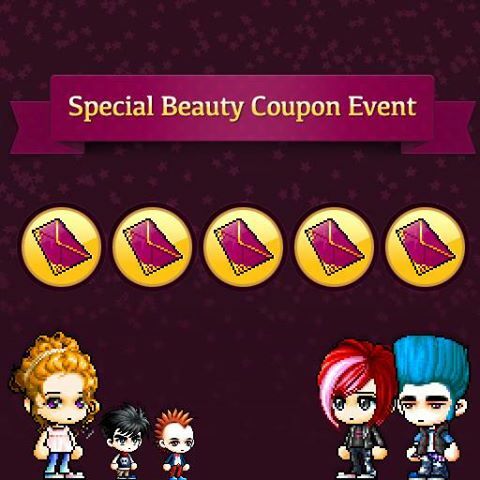 The Special Beauty Coupon can change your hair and face to a random REG or VIP style. Then how to get the coupon? Searching monsters from river to valley throughout Maple World, these monsters are dropping Special Beauty Coupons. You need to hunt monsters within your level range (10 levels below and 20 levels above), and then grab the coupons they drop. Use the coupons to randomly change your hair, face, and skin. Each coupon can be used once, and they expire 24 hours after being received. It should be noted that you need to use coupons carefully since these changes are permanent. Rember that Royal and All Stars hair and face styles are not available through the Special Beauty Coupons. The event run from February 8th until February 28th.